Honest to a fault, Still Alice feels as heartbreaking as you might expect any traumatic event in your own personal life to affect you. The story is basic, the people are familiar and the storytelling is uncomplicated. In some fashion you might peg the film as something of a Lifetime story in pedigreed actors clothing, but it is only because Alzheimer's has become such a hackneyed topic at this point. This is unfortunate as the disease is of course a very serious one as well as being close to soul-crushing for those who bear witness to their loved ones slowly drifting away from the person they once were. Thankfully, I've never had to deal with the disease in any form with any family members, but as it's been used in films before it is easy to see why storytellers not only position it to gain large amounts of sympathy for their characters, but depend on it to pull in the entire emotional investment of their film. When used correctly though, stories concerning Alzheimer's can not only be affecting and moving, but like Still Alice, they can be eye-opening. There are moments within the film that naturally ring familiar and tread the line of being somewhat overly-sentimental and manipulative but this is only due to the timing and use of lyrical songs as well as the inclusion of a big speech to clarify the emotional peak of our protagonist. These moments are few and far between the more personal, small highlights of what it's like to exist outside these moments though. This introspective look is what sets the film apart from something you might see on late night cable along with, of course, the lead performance of Julianne Moore that has all but guaranteed her an Academy Award this year. 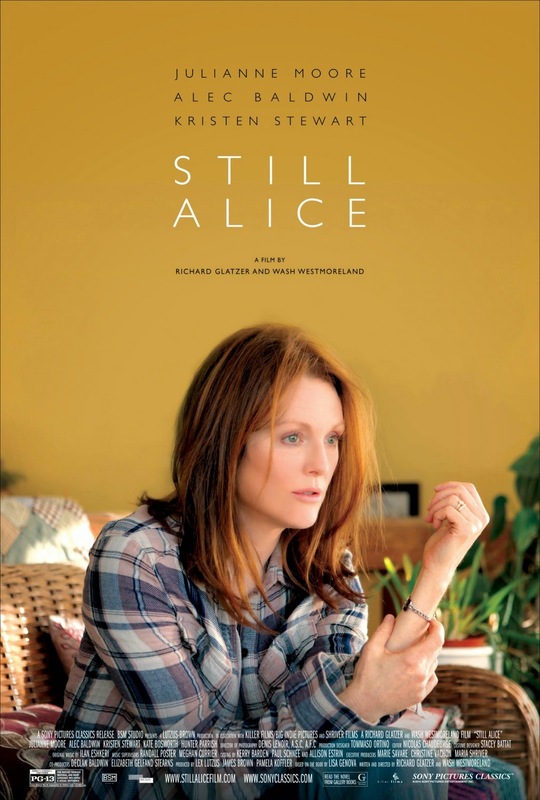 Still Alice is not a film that screams innovation and isn't even anything to necessarily write home about, but it does take you in completely as you give yourself over to its briskly paced hour and forty minute run time. Concerning itself with the basics of life and the unforgiving nature of the disease at the heart of its story Still Alice provides a no frills look at both deterioration and inadequacy in the human spirit that cannot be controlled and is all the more poignant for it. John Howland (Alec Baldwin) and his wife Alice (Julianne Moore) cope with an unexpected diagnosis. Moore plays Alice Howland, a happily married woman settling into the second half of her life as the film opens on her fiftieth birthday celebration. She has three grown children, Anna (Kate Bosworth), Tom (Hunter Parrish) and Lydia (Kristen Stewart). Alice is happily married to John (Alec Baldwin) and a renowned linguistics professor at Columbia along with John, a doctor at the university. While Alice certainly seems to have it all she has seemingly worked hard for this picturesque life and has been rewarded by the majority of her children who have gone on to become doctors and lawyers. Anna, the oldest, is the lawyer and is trying to get pregnant with husband Charlie (Shane McRae). Tom is finishing up med school while going through a bevy of girlfriends none of which he can seem to settle on while Lydia is the dark horse having left the families New York City safe haven and ventured out to Los Angeles to become an actor. As a woman steeped in academia who prides herself on her accomplishments it is hard for Alice to accept her daughters uncertain and inauspicious career path. All of these relationships and the dynamic of keeping up with the ever moving lives of her family only help to build to the moment Alice receives her devastating diagnosis. It begins with the small things such as forgetting certain words, escalating into becoming lost when going on jogs around a campus she has known for the better part of her adult life and only getting worse from there. In visiting a neurologist Alice learns she has early onset Alzheimer's disease. One could take the film from here as Alice and her family finding a way to work through this unexpected trial and how the ties that bind are tested under such stress and tragedy, but moreso the film is about learning to cope and if there is any, the best way to do so while still maintaining some kind of normality. The way in which directors Richard Glatzer and Wash Westmoreland handle the transitions of the family from helpful hopefuls to slightly more jaded pessimists is nearly flawless and only serves to make the story all the more recognizable. Glatzer and Westmoreland, while not having anything of note that might serve as a reliable precursor to this film, are more than adept at understanding it is best to let the actors breathe and not distract us with anything else. This is a pure human story and so why go any other route than approaching the characters with anything other than a focused style? In doing this and allowing Moore to exude her incredible talent through this woman we get more than just a simple look at pain, but more we understand the psyche of someone losing the understanding of their own tragedy. It is noted many times throughout Still Alice that memories are our most precious possessions and so how are we to see this loss of all that we hold dear as anything but harrowing? Through Alice, Moore presents a study of struggle. It is in her looks that we find the most agonizing of moments. Some of the looks are that of realization, others are that of confusion and when you land somewhere in the middle they are simply that of being scared. It is a real gamut of emotions that Moore must run in order to keep the worsening effects of her disease both in check and in line with a natural progression without ever making it all seem as melodramatic as it could easily resort to. That would be the easy way out, for both Moore and her directors in broadly appealing to the mass emotions of those in the audience while showing the heightened moments of sorrow in exaggerated fashion, but Moore is too tempered an actor to allow that to happen. This allows Alice to take on the disease as if it were a challenge rather than a fight already lost. Alice takes to testing herself daily, to putting questions in her phone that she forces herself to answer while being unafraid to use her illness to appeal to Lydia and her desire for her to go to college. As much as the relationship between Alice and John is understood for what it should be (a loving, solid marriage) the film focuses more on the children and their individual dealings, especially Lydia, opening up the second half of the film to something more than just an internal struggle, but a sense of appreciation from her children both in reflection and more importantly in the present moment. Lydia (Kristen Stewart) assists her mother after she is diagnosed with early onset Alzheimer's. If Still Alice wants to remind us of anything though it is how fast life seems to pass. There is a moment a few months after receiving her diagnosis where Alice and John have escaped to a beach house for the summer. It is clearly a place they visited often when they were younger and therefore holds many a fond memories for them. They talk of the times they had, John keenly touches on the loss of Alice's mother and only sibling in a car accident when she was young by referencing how he wishes he could have met them. The couple then sit back to take in all that they've accomplished in their lives and how it all has come to something of an unceremonious end. It is one of the small moments of perspective, of reflection where you can tell the characters are present rather than simply being in a place for the sake of feeling obligated. This isn't a wedding, a party, a charity event or even one of Lydia's plays where fun and spontaneity is the expected convention, but rather it is natural, improvisational and more than anything it is honest. It is in these moments that the film thrives, that we as viewers see ourselves in these characters no matter if we ever share their circumstances. That Moore and her supporting cast are able to transcend the material in such a way that we can relate in this fashion and then be able to pull back to the overall point of the narrative to sledgehammer our emotions home give this simple film an unexpected amount of weight. The relentlessness of Moore's character is so tangible, so intense that it is clearly what will resonate for days after walking away from the film. These kinds of aforementioned moments are all we have and at the rate in which our lives disperse it is vital not just that we recognize this truth, but that we stop to invest and find value in these moments when they are unexpectedly presented to us. I always find a discussion about time and perspective one that can be heartfelt while being completely logical and understated which is the kind of mature conversation Still Alice brings to the table.